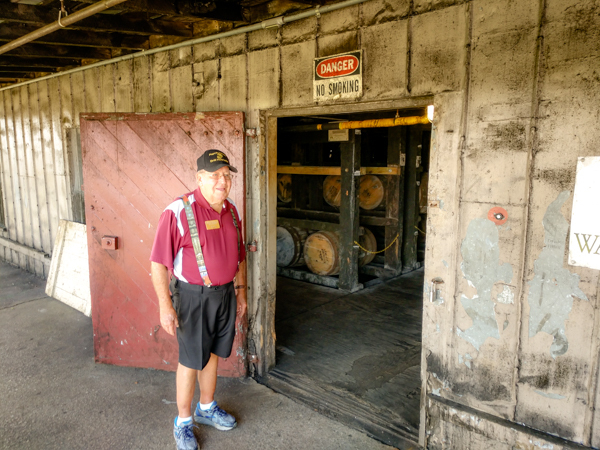 For the bargain price of $11 each, Storm and I take a guided tour of the Wild Turkey Distillery. “Bubba,” a 78 year old Marine Corps Drill Sergeant from Salisbury, NC, guides our unit of tourists and keeps us in stitches with distillery trivia. In the museum, I learn that during prohibition the distilleries kept producing planning for the future repeal of that law. To thwart thieves anxious to raid the forbidden liquor filled warehouses, landmines were planted around the storage perimeter! 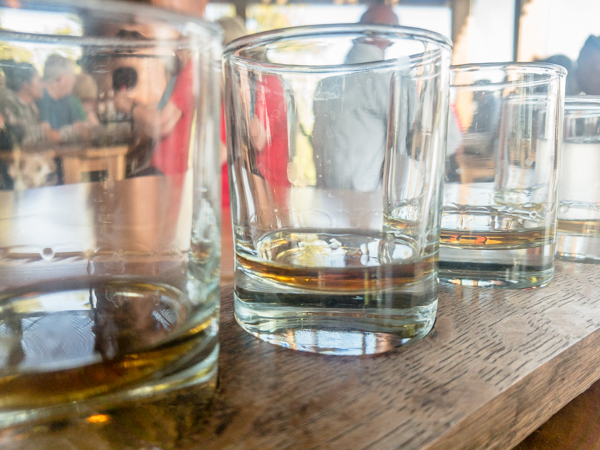 Our tour ends with Storm sampling a flight of Bourbon and his mood begins to mellow. We luck up on Tuesday and get the last 2 tickets for this week to tour the nearby Toyota Plant. Note to future visitors, be sure and make a reservation for this attraction way in advance if you are headed this way. As our tour tram departs the loading area we glide onto the production floor. The frenzied activity here resembles a cross between Hogwart’s dining room and the movie WALL-E. Instead of lighted candles, food and ghosts floating overhead, freshly painted car doors, bumpers and chassis whisk magically over us. Monocular robots methodically weld auto parts while driverless vehicles deliver just in time to assembly lines beside us. Storm calls it controlled chaos. We both spend the entire ride with jaws dropped and eyes agog. No pictures are allowed in the plant. We are not even allowed to take our phones on the tour. You will just have to believe me when I tell you this free ride was worth 10 times what we paid! 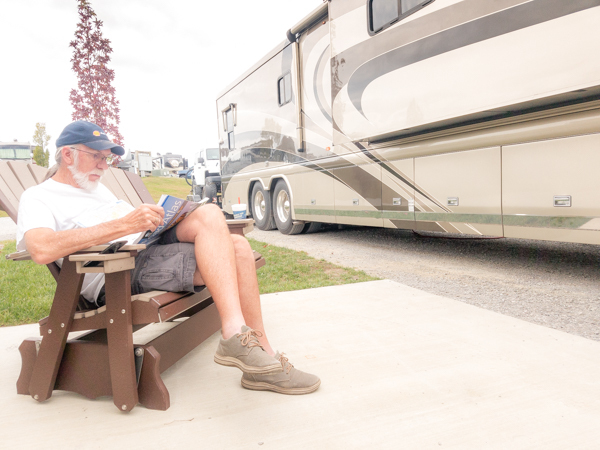 Whispering Hills RV Park where we snag a premium site proves to be an oasis of relaxation. 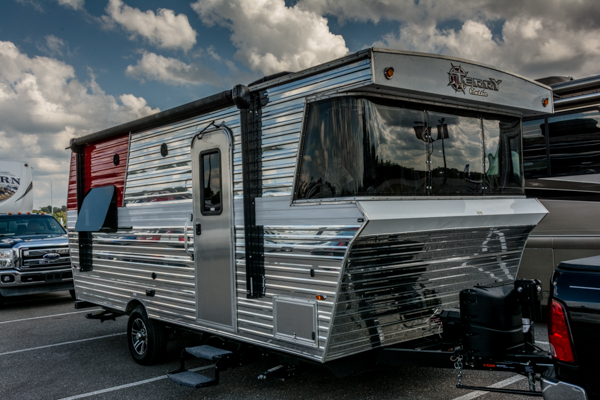 With a glider swing on our site, a concrete pad and 90′ of parking space we are in high cotton. I am a little disturbed about some of the signage in the non-premium areas though. 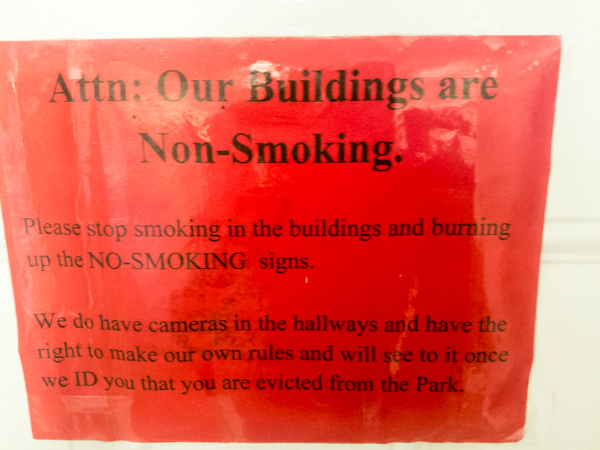 Apparently there are some militant smokers who hang out near the laundry/shower buildings – see sign below. Wandering around Kentucky’s capitol, Frankfort, we stumble across Rebecca Ruth’s Candy Shop. Here Storm loads up on Bourbon Cherries, his new favorite candy. 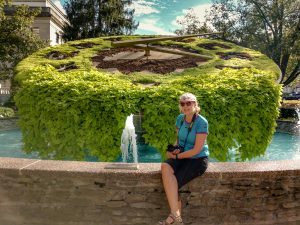 We manage to find the floral clock on the capitol grounds, but it appears to be under seasonal maintenance. Lots of green, but none of the web touted vivid floral displays. They are smoking AND burning up the signs??? 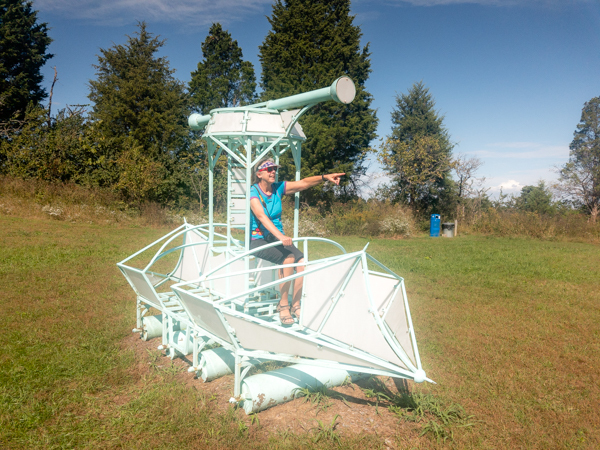 Our last stop at Josephine Sculpture Park is not as entertaining as we had hoped. Each confounding work of art requires a hot, humid, hike through tall grass. 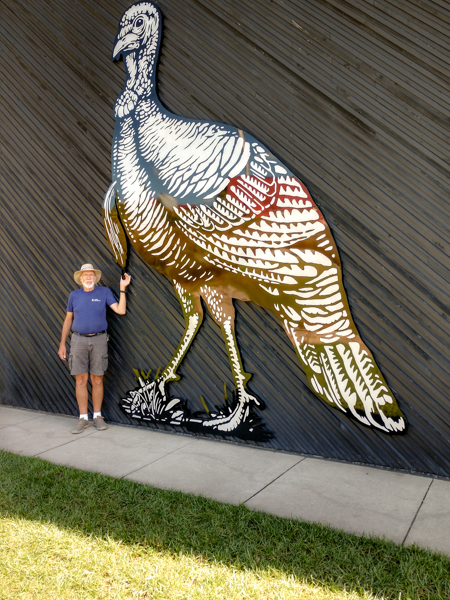 Unfortunately, we did not bring enough Wild Turkey to sufficiently enhance our art appreciation for the displays here. I suggest a bourbon picnic lunch if you chose to visit this free park. No, we spent a couple of days checking out the Georgetown/Frankfort area. 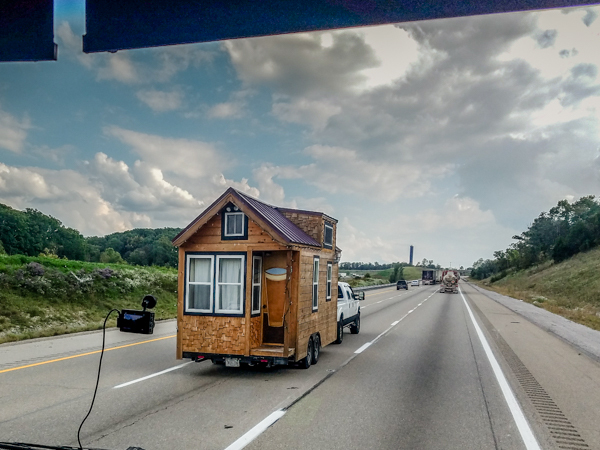 More to see and do there than we imagined. WOW – sorry to hear of your mold and leak problems. Were they caused by the recent storms? I am sure that if anyone can handle it, YOU CAN! !